The alarmists never rest. Despite UNESCO giving the Great Barrier Reef (GBR) a clean bill of health alarmist scientists have increased their doom and gloom propaganda. Members of the James Cook University centre for excellence for coral reef studies, Andrew Baird and Terry Hughes have declared the reef has been all but destroyed by man-made global warming. When professor Hughes advised his students of the parlous state of the GBR there wasn’t a dry eye in the lecture theatre. Projected increases in carbon dioxide and temperature over the next 50 years exceed the conditions under which coral reefs have flourished over the past half-million years. This is not true in a number of respects. Firstly the models which the alarmists rely on to generate such doom and gloom predictions have been proved to be wrong and inadequate. 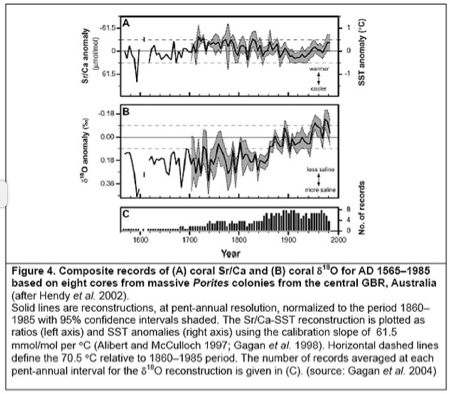 Secondly, recent past conditions on the GBR have been shown to be warmer than current conditions. Hoegh-Guldberg and his fellow alarmists should have been aware of this historical perspective. Instead they have resorted to base alarmism which as usual the MSM have lapped up. So instead of a natural cycle we have the imminent death of the GBR caused by humans and their CO2.